This year, my husband Eric has decided to issue me a design challenge each month to get me out of my comfort zone and to help clear out my bead stash... we're calling it the Honey Do List. This month's challenge posed by my sweet husband is all about working in black and white. He wanted me to move away from my typically colorful creations and focus on using only black, white, and shades of grey. Something I've discovered as I take more pictures is that some are all about the colors, while others are about structure or shadow and light. As I watched Sarajo creating colorful jewelry with glass, crystals, stones, and textiles, I decided to make this month a little more challenging. This month I want you to create a piece in black and white (including shades of grey)! Feel free to take inspiration from the photos, or ignore them completely and just work with monochrome. The first thing that popped into my brain was to make a black and white (and shades of grey!) version of the macrame bracelet I learned in Erin Siegel's class on my first Bead Cruise. I had just ordered some zebra jasper rounds and black waxed Irish linen, so I had everything I needed to get going! These bracelets are super fun to make and kind of addictive... so I had to make two! For my second one, I used some pyrite rounds I had in my stash for a version that's all different shades of silver. In an odd way I made a nod to each of the photos Eric chose with the buttons I used. 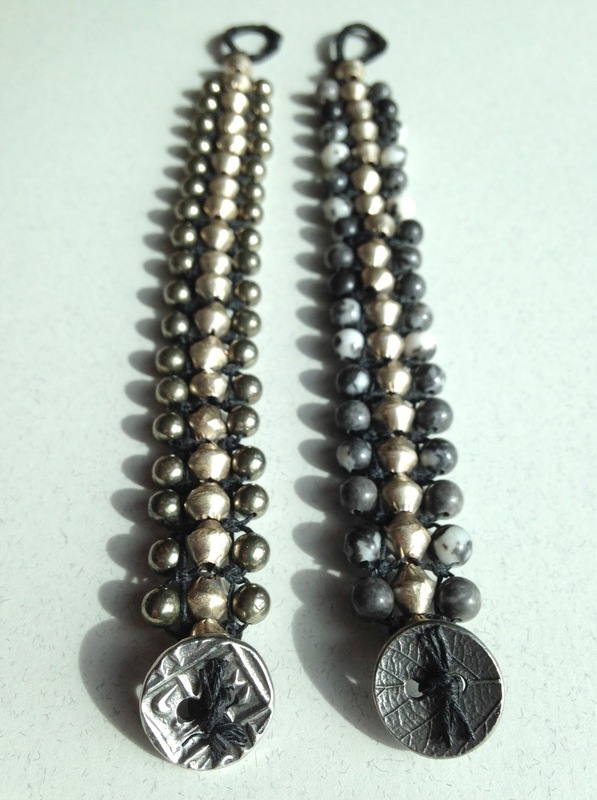 The zebra jasper version has a geometric pattern to it while the pyrite one is a leafy design, perfect to pair with the flower. Not content to stop there, I also made a necklace. I may have cheated a tiny bit by choosing a flower shaped pendant with a little bit of yellow in the center. Everything else in the design plays by the rules so I'm pretending that the center of Eric's flower picture was colorized! 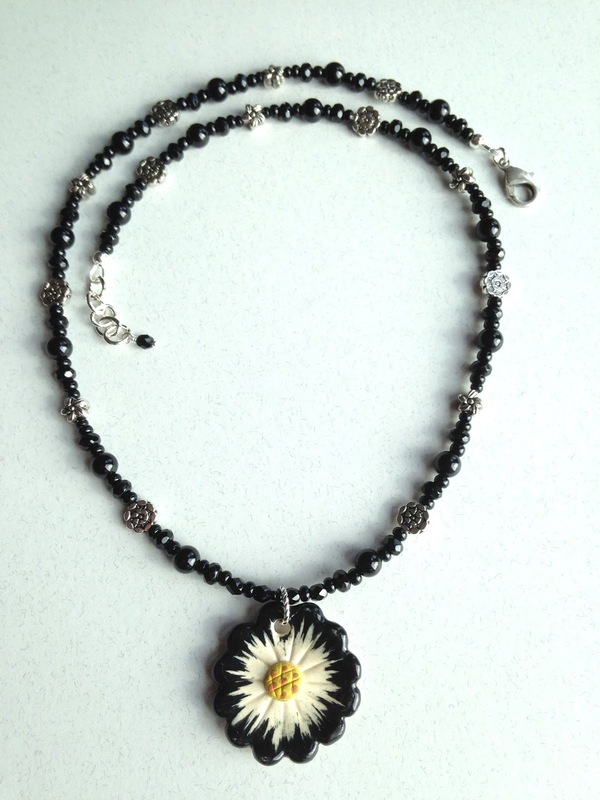 I kept this strung design pretty simple... just using black Czech glass, onyx rounds, black seed beads, with some flower shaped pewter beads to break up all that black! That zebra jasper is perfect for the challenge! Thanks for including others in your fun! I love the pendant too! My favorite part of your designs are the gorgeous buttons you used! Thanks so much, Alison! I'm still itching to make more of the macrame bracelets (this time with lots of color). I got the pendant when we visited Asheville last spring at Chevron Trading. beautiful pieces. ilove the zebra jasper. i had fun and i hope you do more of these challenges. Thanks, Alice! We will definitely keep doing these challenges... I think Eric is enjoying telling me what to do for once! wow! love that last necklace! I look forward to these challenges, but this month I am going to have to decline, as our area has been flooded big time (North Louisiana), and I've been dealing with that. We were ok, but many in the community have not been so lucky and we are trying to help others in need. Look forward to next month's challenge! Thanks for your kind words! I'm so sorry that you are dealing with all the flooding in your area... I'm glad that you are ok and are in a position to help others. Keeping you in my thoughts! Check back on April 1st to see what Eric has in store for us next month. I hope you can join the fun next time! The flower pendant is perfect! Eric just said you had to be inspired by his photos. I love the macrame bracelets. I haven't done that since college. Can't wait to see what your hubby springs on us next. Love how these turned out! And really happy that others took inspiration as well, very cool how everyone had different takes on the subject! I'm readying the next challenge now!